It’s no secret that any dental practice runs on a regular influx of patients. Whether these patients are through referrals, family members, or friends of others already in the practice, the reality is that without them there would be no way to keep their offices moving. But what number of those patients come again? How many of them come on time and continue to make their appointments before something’s gone awry? I’m willing to guess that the number is pretty slim. Not only is this bad for business—it’s the key for dental practices to remain in business, remember—but it is bad for the patient, too! Patients who go too long between checkups often find themselves with more problems than when they started. This makes it crucial for everyone involved to continue patient care throughout the year and on a regular basis. Things happen. In fact, things happen a lot, and usually when we least expect them. No matter what your appointment book says, there’s likely to be situations that come up throughout the day. You’re only human! However, “running behind” like a bad date, leads to a bad impression, and in turn leaves your patients wondering how much they truly mean to you. Instead of leaving your patients sitting in the waiting room for an extra thirty minutes, create a system that will let them know beforehand that you’re running behind. Likewise, choose to not penalize patients for cancelling when you’re going to be late. Remember, they have lives too, and will likely need to rearrange their schedules to appease your new one. You’ve heard the clichés; you know that the rule in any healthy working relationship is a balanced dose of communication. Guess what? You and your patients are in a relationship, too, meaning you need to keep them in the loop. Ensure that your patients can keep in contact with you and not just through a phone line. Create a Facebook page where they can message you with personal questions or concerns, and where you’ll answer in a timely fashion. Allow patients to email you with their worries over the weekends and holidays. Keep in mind that handing out a personal cellphone or phone number can lead to an over flow of patient calls, however, so be mindful before giving out your phone information. Instead create a method that’s easy, non-invasive, and that will, allow them to be heard and understood. By welcoming your patients into your world, you’ll let them know that you value their time and health, providing a safe space for them to come for checkups bi-annually. I once went to a dentist office and found out I had two cavities, yet somehow, by the time it came to scheduling future appointments for my fillings, I had four. From two to four! Not to mention, that by the time they saw me, I actually only had one cavity. How’s that for a reason never to want to return to a dentist again? I see this happening more and more because of the annual drop-off in regular dental patients, leaving dentists to scramble and find ways to make more money. This leaves patients with misgivings about their practitioner and whether they truly have their wellbeing at heart. Monetary gain should never be at the expense of the patient. Read that again: it should never, under any circumstances, ever be at the expense of the patient. Your patients have entrusted you with their health and you should never, as a doctor of dental science, take advantage of that trust. Of course, the irony is that when you run a truthful, communicative, and thoughtful practice your patients will want to come back to see you again for any problems they may experience; making cheating to bring patients back unnecessary. Create an environment that explains, rather than tells, your patient why they need certain procedures. Show them where trouble areas are and help them understand what they are seeing on x-rays or 3D imaging. Don’t expect them to take your word that they need a dental implant, but show them why it is that that particular procedure is most beneficial for their health. In effect, shy away from telling your patient what needs to happen and help them gain a better understanding of why certain procedures should take place. In short, allow your patients to make the decision for themselves. You may think your patient’s appointment experience begins from the first moment they open the front door, but you’d be wrong. It actually starts from the onset of their scheduled appointment and never truly ends. From the time your patient makes a call to schedule an appointment, your office needs to be prepared to give them quality and personal assistance. Your front desk should make every effort to accommodate potential patients, send out reminder calls, and ask if they need anything on the office’s behalf to make their appointment more comfortable. No longer limited to cosmetic dentistry studios, many offices have now embraced the dental spa philosophy, offering high quality amenities to go along with state-of-the-art dental technology. The combination provides patients with a one-of-a-kind experience, a relaxing atmosphere, and incentive to return to the practice. Providing patients with quality service from the onset will stick their mind long after they’ve gone home. It will be the backbone of why they refer people to your practice and of whether or not they decide to come back again six months down the line. 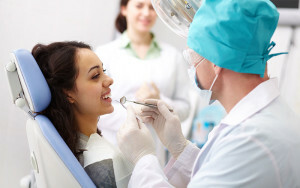 Trust in the dentist and his/her team is what helps practices see a return in clients. For this reason it’s important to make absolute certain that each member of your staff, whether on the clock or not, constantly provides excellent customer service to each patient, big and small. Some fail-safe methods for bringing your patients back never fail. Sending out birthday and holiday cards, for example, are ways to keep in touch personally with your patients, while reminding them throughout the year about their dentist office. Personal phone calls made every 3-4 months are also a great means for gently reminding patients that they to make an appointment for a cleaning. Finally, the ever popular “reminder cards” are an easy way to make sure that your office sees patients returning for years to come. Doctors, and dentists in particular, rely on patients to keep their business spinning. Because of the scare factor with dentist practices, patient drop off is high—when in reality it should be low. Help your practice by giving your patient a reason to return every six months, providing you with business, while leaving them with radiant smiles. Kelsey Farrell is a freelance writer and editor who ismarried to an ultra-marathoner that also happens to be getting his PhD. Though not a doctor herself, listening to her husband’s daily woes aboutall things science has given her a healthy interest in anything in the medicalfield. She earned her Bachelor of Arts in English from San Diego StateUniversity and graduated in 2014 with her Masters in Professional Writing fromthe University of Southern California. When she’s not working on her novel, she spends her time writing about interesting things for interesting people. Previous PostThe Health Benefits of Cosmetic VeneersNext Post Can a Dentist Cure My Snoring? Kelsey Farrell is a freelance writer and editor who ismarried to an ultra-marathoner that also happens to be getting his PhD. Though not a doctor herself, listening to her husband’s daily woes aboutall things science has given her a healthy interest in anything in the medicalfield. She earned her Bachelor of Arts in English from San Diego StateUniversity and graduated in 2014 with her Masters in Professional Writing fromthe University of Southern California. When she's not working on her novel, she spends her time writing about interesting things for interesting people.